So with sustainability on all fronts. It’s about seeing and creating connections, up close and across broad vistas. 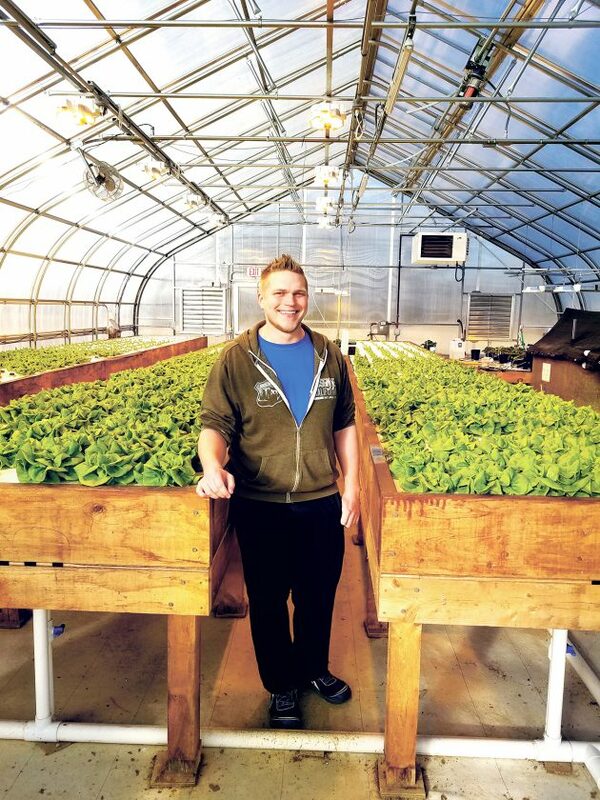 Sean Fogarty is a University of New Hampshire SAFS (Sustainable Agriculture and Food Systems) master’s student working with fish and lettuce in the OASIS project, one of the newest sustainability projects on campus – one of many. Fogarty checks the three newly constructed greenhouses perched atop a hill at the 360-acre Kingman Research Farm, located in Madbury, about two miles from the Durham campus. Primarily a research facility, current projects include research on horticultural and agronomic crops, wildlife management, and a part of the Great Bay oyster renovation effort. As he agreed to allow me inside to view these hydroponic agricultural laboratories, he asked that I put my hands in my pockets and not touch anything. He is checking the dark fish tank where tilapia are growing, secreting nutrients into water that is then piped into the supporting system for growing tables containing lettuce seedlings – lettuce growing in fish water. No soil anywhere, just water, seedlings and fish. The UNH Project OASIS – Optimizing Aquaponic Systems to Improve Sustainability – began in 2016 with four engineering students – Siddharth Nigam, Paige Balcom, Will Tavares and Allison Wood – mentored by Todd Guerdat, assistant professor of Agriculture, Nutrition and Food Systems and Andrew Ogden, Senior lecturer in Sustainable Agriculture and Food Systems, both in the College of Life Sciences and Agriculture. The engineering students visited Uvita, Costa Rica, for a week during winter break to access needs, build relationships and lay the groundwork to design a sustainable aquaponics system expected to produce fresh vegetables and fish for a Uvita community, in hopes their model might be utilized for communities across the globe, especially geographically challenged areas. A few miles down the road opposite the field house at the Fairchild Dairy Farm are two greenhouses where Peter Kane manages the “Farm to You NH” sustainability project that grows greens and other vegetables to supply three dining halls on campus. Kane is growing field greens, tomatoes, cukes, canatalope, peppers, garlic, onion, strawberries – two tunnels on a half-acre. Right now, they produce 5,000 pounds per year on less than an acre of land. Kane is hoping to expand with two more greenhouses next year. Kane is working with a new chef Zachary Marshall at the Philbrick Dining Hall, who is very enthusiastic about this effort even though, of course, in terms of the amount of food consumed on campus, this new project is still a drop in the bucket. However, a baby step counts. Both Fogarty and Kane tend to the daily details – without that attention, no agriculture could be sustained. But these two projects are tiny compared to the “bird’s eye” view of sustainability at the University of New Hampshire. Founded in 1997, the Sustainability Institute at UNH is the oldest endowed sustainability program in higher education in the U.S. Its list of awards and accolades fills a website. Recently, the Association for the Advancement of Sustainability in Higher Education awarded UNH the 2017 STARS Platinum rating as one of just three such universities – along with Stanford and Colorado State universities. In addition, the Sierra Club named UNH No. 2 out of 269 Cool Schools List, up from No. 19 in 2017. To say that such accolades are well-earned is a major understatement. University Sustainability goes in multiple divergent directions. Most recently, it was designated the first university in the country to use landfill natural gas to run its facilities. A co-generation plant using processed landfill methane, transported via 12.7-mile-underground pipeline from Waste Management’s Rochester landfill, provides heat and electricity for the 5 million-square-foot Durham campus, replacing commercial natural gas as the primary fuel source. In addition, UNH composts from 25,000 to 40,000 tons of organic waste from its campus dining outlets each month. The university takes sustainability across the curriculum, offering 450 undergraduate and 120 graduate courses with a sustainability component and three sustainability focused majors. Pondering the UNH 2018-22 Sustainability Institute Strategic Roadmap is viewing a planning playbook for visionary, cross-disciplinary thinking that translates into research and action. What the University of New Hampshire has accomplished thus far is remarkable and encouraging. It is teaching students, the local community, the state and even our national government key lessons in sustainability. By building bridges between disciplines, we stop thinking that one discipline has the answer. Instead, the catalyst for a solution rests in the conversation between divergent ways of thinking – between the birds and the frogs. Are you a bird or a frog? I think I must vacillate between the two. When I am first discovering a new idea, I am the frog, but then when I am done wallowing at the micro-level of the soil of a topic, I need to fly away from it, and perch myself on a branch above the garden to take in the wider horizon. The power of promoting these conversations is nothing less than stimulating and instilling a collective conscience, using every discipline we use to think about reality and the world, to save ourselves by saving the planet. Quincy Whitney is a career journalist, biographer and poet. Contact her at quincysquill@nashuatelegraph.com and quincy@quincywhitney.com.